I've been to lunch at both Cafe Blossom locations, and each time I walked away satisfied and with my normal envy of all vegans living in NYC. Whether you live uptown or downtown, you have such an array of vegan restaurants to sample. The upper west side spot has a large outdoor patio area with a little shade. The village location on Carmine Street is newer, and has a decidedly chic feel to it. The inside is cool and dark, and has the perfect ambience for a romantic date night. We went for weekday lunch on a super rainy day, and as the rain cleared, more people came in to eat, but it never got full. We started with the beet ravioli and thought it was fantastic. My mother, who leans towards eating more veggies and beans but still eats meat and dairy, thought it was "out of this world." 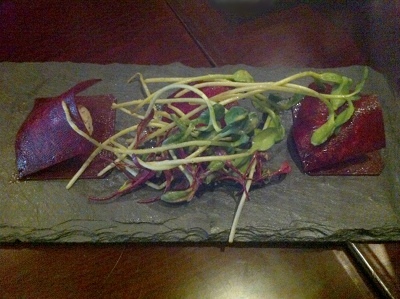 It was made of large, thin slices of beet filled with homemade cashew cheese, and topped everything with micro greens and sprouts. It was refreshing and flavorful, though it was slightly salty for my tastes. 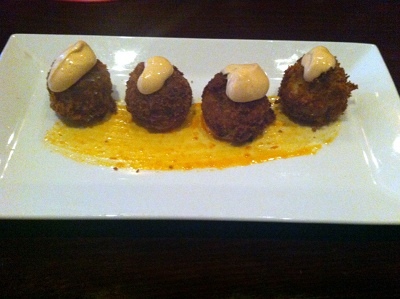 We also shared the black eyed pea and potato cakes appetizer, which were basically little croquettes that were properly fried and therefore not greasy. They topped it with a garlic aioli sauce that didn't overwhelm the cakes. I normally stay far away from aioli and mayonnaisey-type sauces, but Cafe Blossom's didn't have that cloying sticky texture, and it was flavored perfectly. I always have a hard time making decisions in fully vegan restaurants. I'm just not used to having my pick of anything on the menu, and it overwhelms my senses. In this setting, I decided to cede the decision making to my sister. When I tried the Upper West Side location, the entree I remember most distinctly was the vegan burger. My husband said it was the best burger he's ever had in his life, and he's had a few. Neither my mom nor my sister wanted to try it on Carmine Street, but I'm sure it's just as good and might be my first recommendation for someone visiting either location. 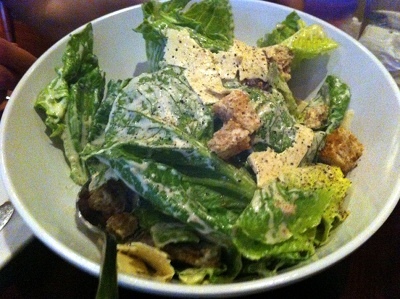 For this Cafe Blossom lunch, my sister and I split their Caesar salad entree and thought it was delicious. What drew us to ordering a salad at a vegan restaurant was the fact that they topped it with homemade shaved mozzarella. As a vegan, when you see that on a menu, you try it. I did like the mozzarella, but I think if they did a shaved parmesan with a bit more bite (perhaps something like a sharp Dr. Cow cheese), it would have had a more interesting texture. We also tried the Tofu Benedict. I have to say, I don't think I ever tasted an Eggs Benedict when I wasn't a vegan, so it was hard for me to measure this dish against anything else. From the pictures I've seen of Benedicts, this aligned very well. 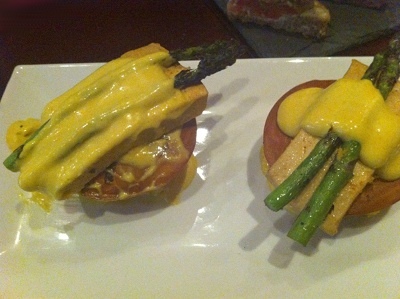 They started with a chunk of cornbread, covered it with smoked tofu and homemade seitan "ham", and then topped the whole thing with grilled asparagus and a nutritional yeast Hollandaise sauce. The dish was good, but perhaps not my favorite item. The best part of it was the fresh, in-season, local grilled asparagus. My mom tried a TLT, which also showcased the smoked tofu and homemade ham. She chose the dish mostly for the avocado sandwich, and might have been happier with just avocado on toast, but my sister and I enjoyed her leftovers. 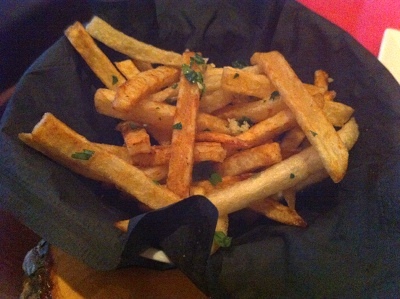 My mom's second favorite thing (to the beet ravioli) were the garlic herbed french fries. I definitely recommend you check out Cafe Blossom at one of the two locations in Manhattan. 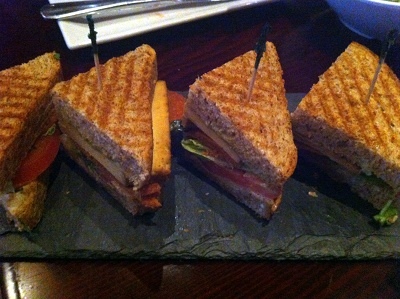 They have friendly, knowledgeable servers, great ambience, and delicious food. What more can you ask for?